As we weave our way through our most serious ‘global energy crisis’ to date, it’s easy to forget that everything is energy. We learn it from Einstein in grade school, E = mc2; another way of saying that energy is equal to everything and everything is equal to energy. Seeing a source of energy where no one else did, Hiremath created the e-charkha as an ingenious adaption of a ubiquitous tool. A true example of form [almost] following function, the e-charkha produces 6 – 9 Watts of power. After just two hours of spinning it generates enough power to run its custom LED light source for 6 – 7 hours, significantly extending working hours and therefore income. Families using the e-charkha’s LEDs could also avoid relying on toxic kerosene lamps, thereby reducing medical costs as well as time away from work or school. At a total estimated cost of around Rs. 10,000 (US $200), the e-charkha represents a significant investment to its target market, but they are currently being given away by the Indian government program Funds for Regeneration of Traditional Industries, (SFURTI). Additionally, there seems to be some interest in building an infrastructure around the e-charkha, khadi (handspun cloth), and fashion industries with the appointment of a new chairperson of the Khadi and Village Industries Commission, Kumud Joshi. ‘Mission Khadi’, is another plan to support the industry by using khadi fabric in contemporary fashion design in conjunction with the National Institute of Fashion Technology (NIFT). While not so different from other small-scale generators and kinetic energy harvesters, the e-charkha does represent a real way to improve the health, income and lives of millions of poor families. Mahatma Gandhi said, “In my dream, in my sleep, while eating, I think of the spinning wheel. The spinning wheel is my sword. To me it is the symbol of India’s liberty.” He may have been more prescient than even he could have imagined. We’re looking forward to seeing how the e-charkha develops as more become available. This seems only to work psychologically. A person would use the same energy spending some of their time spinning khadi and then moving on to a hand (or foot) powered generator. The advantage is that while you might get bored just spinning a generator, you might not notice the difference in effort to spin khadi with a generator attached. 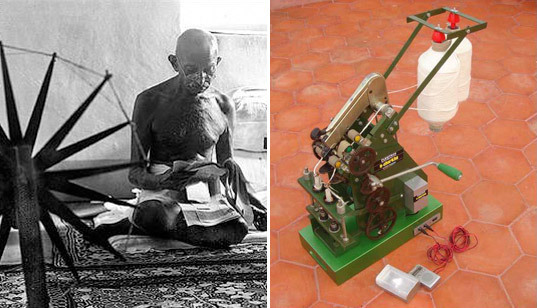 The e-charkha is an ingenious update to India's ubiquitous charkha [spinning wheel] that transforms the simple machine into a potentially significant source of energy for millions of struggling families in India. 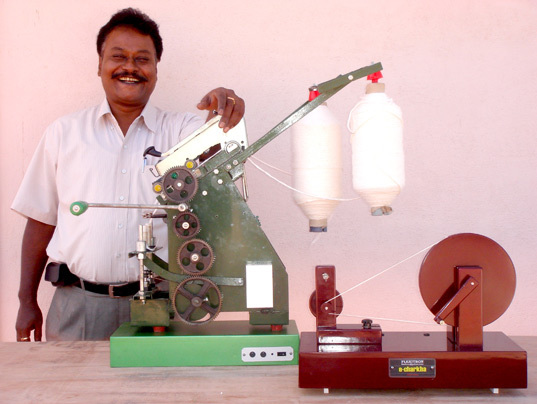 Designed by RS Hiremath, the e-charkha "not only produces yarn but also generates electricity using a maintenance free lead acid battery fixed at the bottom, which functions as an inverter."